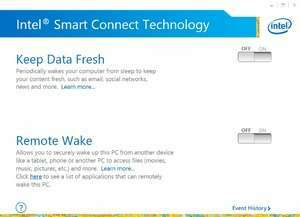 Intel Smart Connect Technology is designed to update programs by periodically waking your PC from Sleep/Standby mode for a brief period of time. Intel Smart Connect Technology is intended to be installed on a PC system that was purchased with Intel Smart Connect Technology installed from the manufacturer. This version of the software requires a previous version of Intel Smart Connect Technology on the computer system in order to install and run. For security reasons, you should also check out the Intel Smart Connect Technology download at LO4D.com which includes virus and malware tests. Additional screenshots of this application download may be available, too. 3 out of 5 based on 74 ratings.